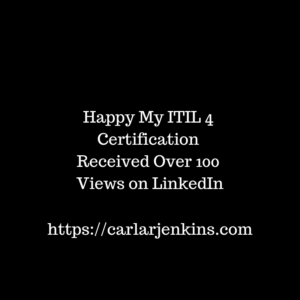 I am grateful for the LinkedIn community support on my receiving my ITIL 4 Certification! 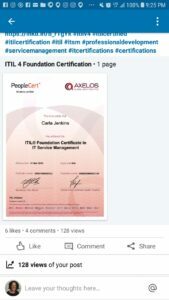 As a business blogger and certified project manager, being acknowledged on LinkedIn is wonderful. Receiving over 100 pageviews on LinkedIn warms my heart! Check out the screen shot below. In the meantime, follow me on LinkedIn for the latest and greatest in social media, personal branding and project management.